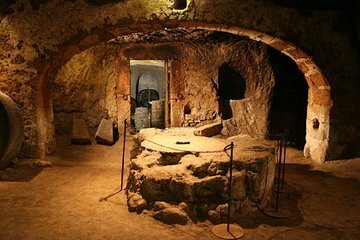 Nesta excursão pela histórica Orvieto, você não verá apenas o que está acima do solo: em vez disso, siga seu guia em uma exploração subterrânea pelas cavernas de Orvieto, que chegam às centenas e abrigam assentamentos desde os tempos etruscos. Em seguida, continue para outra experiência tradicional: um almoço com vários pratos em um restaurante local. Experimente queijos artesanais, charcutaria, vinhos e massas, e visite as adegas privadas do proprietário após a sua refeição. The underground cave tour was fascinating and very well done! We thoroughly enjoyed it but hadn't realized we could have purchased that ourselves for only 6 euros each on site. The lunch and wine tasting that followed was fabulous for me but not so great for my husband who is gluten-free. We had notified Viator of that fact and our host at the Cantine Foresi was very disappointed that the information had not been provided to me. Result was that my husband missed out on the lasagna as well as the dessert. He would have missed out on the olive oil/pate on bread as well had he not happened to have a couple of rice crackers in his backpack. However, we both enjoyed the experience at Cantine Foresi even if he couldn't enjoy much of the food. The restaurant is very very charming and the host Alessandro is the same. After lunch he invited us downstairs to see his wine cellars. Orvieto is a beautiful little town and should not be missed. Very easy day trip from Rome. A very well organised trip of this part of a beautiful and historic Italian city. The guide spoke great English and answered all questions. The wine tasting and inclusive lunch were 100. In fact so good we had lunch on a second occasion as well. Hi we really enjoyed our caves tour and the lunch was very good. It is always nice to eat the local food. The owner was very welcoming and explained what we were drinking and eating. Great tour and lunch combo -- interesting tour of Orvieto's unique caves, followed by a great lunch at a restaurant overlooking the impressive duomo. Important to know: This is really two separate pieces packaged together into one Viator booking. The tour is the same tour you could book through the tourism office, but I'm glad we booked this ahead of time because the tour was sold out, so people who hadn't booked ahead of time were having to wait for a tour later in the afternoon. After the tour, just go to Cantine Foresi and they'll take great care of you it's on the northwest side of the square facing the duomo. Delicious lunch the porchetta was a highlight for us with generous wine pairings. The owner was very friendly and also gave us a tour of their wine cave. The tour was great and tour guide very informative BUT when asked about lunch we were left standing outside a closed ticket office and had to find our own way to lunch . Tour guide was unhelpful when it came to lunch . Not the best tour. Arrived at meeting spot and there was no one with a sign. Checked in at the underground office and the clerk knew nothing about our booked tour. Handed us each a 6 Euro ticket. The tour underground was cool, but could have been purchased on site. No mention of lunch, had to call. Although arranged through Umbria ConMe, this was a tour that all the arrangements were made from afar. It was a matter of simply showing up and the right place at the right time. We took the train from Assisi to Terontola-Cortona where we connected to another train to Orvieto. From the train we went across the street to enter the tramway. We were delighted to see that the same company that runs the bus line in Assisi also runs the bus line and tramway in Orvieto. Since we had several unused tickets, we didnt have to buy anything more to enter the tramway. It was a smooth ride to the top of the hillside where the old town awaited us. We were greeted by a breathtaking view of Paglia Valley, an old fort and a circle in front of us to an inviting tree lined narrow street that was the main north-south street in town. There we went by numerous shops and looked at the housing in the narrow roadways that cropped up every now and again. We found our way to the start of the Underground. Leading us on the tour, was a local guide who spoke English to about 25 of us. This was a most interesting experience to learn about this vast underground town that existed for over 2,500 years. The underground is below about 75 of the existing town though, only a small portion of it is available for touring presently. We saw 4 of the 400 caves! Early dating reflects that the Etruscans were the first folks to live in the underground. They constructed cisterns, water wells, arches, had large grinding stones that horses/donkeys would have been harnessed to turn to create grains/olive oil and the like. There are several pigeon holes that were built into the underground. This served a number of purposes. The pigeons were a source of manure needed for farming, eggs, feathers and food. After the tour, we walked by the dominating Duomo in the plaza. This Duomo is one of the larger and more elaborate churches you will ever see. It is simply beautiful. We located the restaurant, Cantina Foresi, that is located right on Piazza Duomo. The owner, Alessandro, asked if we were there from Umbria ConMe. We indicated that we were. We were so startled that he knew that we would be there and when! He indicted that Alessandra, from Umbria ConMe, told him to expect us about 1 p.m. and there we were exactly at 1 p.m.! She must have been a teacher in her previous life. Anyway, our light lunch and wine tasting turned into a feast. We were blown away. We were immediately served a full glass of their white wine. A large salad bowl came out for us to share. We then were served a delicious vegetable soup. We were given another full serving of the white wine as a large bowl of fruit was served to us. We were thinking that this would probably be wrapping up shortly, since this is a light lunch. Will then comes out the lasagna and a full glass of red wine. Then comes a cheese plate and dried meat tray and a refill of the red wine. By this time we were so full, that we could hardly touch the cheese and meats. We then had a light dessert that consisted of a caramel and chocolate flan. This was accompanied by a dessert wine. So, to put it mildly, the lunch alone was more than enough for the cost of the tour. Alessandro indicated that his family owns all the vineyards that were associated with our lunch. Their fields are a few miles away. They bottle it and save it in their restaurant cellar. Alessandro gave us a tour of the wine cellar. It was well below the Piazza Duomo. There were wines that dated years ago. Needless to say, the restaurant experience was one to remember. The food was quite good, the location was super and Alessandro gave us superb service. And, oh, yes, we did buy a bottle of wine to take back with us! Unfortunately, the trains between Orvieto and Assisi dont run too frequently and since there is a change of trains involved, we had to leave to return to the train station. We didnt have enough time to explore the town further. It is definitely worth a return trip and a must see inside the Duomo. Alessandra from Umbria ConME has to be commended for having everything set up for us. Although not there to hold our hand, she might as well have. Everything was in order and worked like clockwork. Thank you, Alessandra!